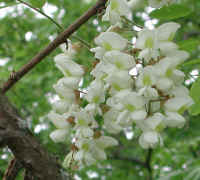 (Black Locust (Robinia pseudoacacia L.) - 01) As strange as it may seem, the black locust, a tree that can grow to heights of 40 to 100 feet, is a member of the pea family, Fabaceae. 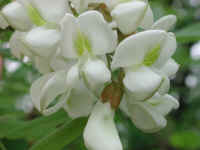 And, like peas, the black locust fixes nitrogen in the soil, providing nutrient to surrounding plants and trees. 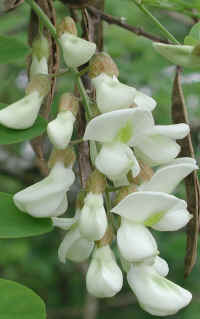 (Black Locust (Robinia pseudoacacia L.) - 01a) This is a closer look at a draping flower cluster with a over-hanging pinnate leaf with leaflets that are only partially opened. 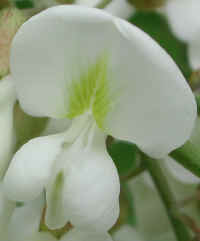 The 1 inch flowers hang in 5 inch long clusters, which appear in mid to late spring. 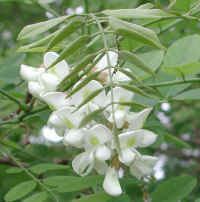 (Black Locust (Robinia pseudoacacia L.) - 02) Unfortunately, the black locust is considered to be an invasive species. 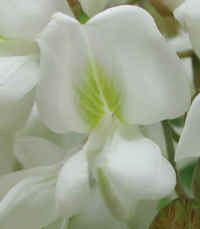 Their beautiful hanging flower clusters with their strong fragrance are believed by some people to compete with native species for pollinating bees. 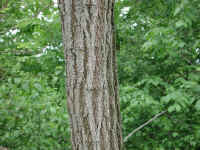 We have lived here at Sleepy Hollow Lake since January 1980, and have seen absolutely no evidence of this; if anything, the black locust are being crowded out by native species. From our perspective, we just enjoy the beauty of God's creation. 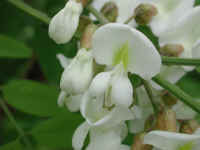 (Black Locust (Robinia pseudoacacia L.) - 03) In this photo we have a closer look at the 1 inch long fragrant black locust white flowers with their yellow blotch on the upper petal. 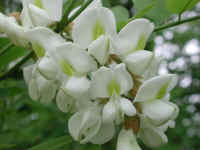 The black locust flowers have the characteristic pea shape. 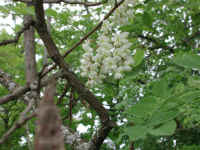 The black locust is monoecious, meaning that it has both staminate and pistillate (male and female) flowers on the same plant. 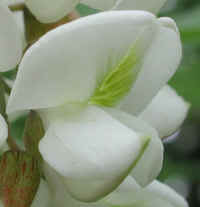 (Black Locust (Robinia pseudoacacia L.) - 03a) In this photo we have a closer look at one of the black locust flowers. (Black Locust (Robinia pseudoacacia L.) - 03b) This is another bee's eye view of a black locust flower. (Black Locust (Robinia pseudoacacia L.) - 04) Looking up into this black locust tree, we can see several clusters of flowers hanging down from the branches. (Black Locust (Robinia pseudoacacia L.) - 04a) In this photo, we have a closer look at a few of the black locust flower clusters hanging down from the branches. 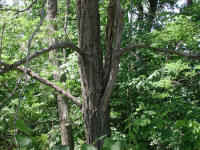 In the upper left of the photo, we can also see another characteristic of the black Locust (Robinia pseudoacacia L.) - the opposing pair of thorns that grow in the location the leaf scars on the branches. (Black Locust (Robinia pseudoacacia L.) - 05) The black locust flowers in these clusters are just beginning to open. (Black Locust (Robinia pseudoacacia L.) - 05a) In this photo we have a closer look at the black locust flower buds as the begin to open. (Black Locust (Robinia pseudoacacia L.) - 05b) The one inch long oval shaped leaflets of the black locust usually grow opposite one another, as can be seen in photo 01a, but as we can see here, this is not always the case. 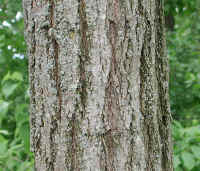 (Black Locust (Robinia pseudoacacia L.) - 06) The thick fibrous bark of the mature black locust tree trunk and branches is grayish brown in color with deep furrows and ridges. (Black Locust (Robinia pseudoacacia L.) - 06a) In this photo, we have a closer look at the black locust bark with its relatively flat ridges and deeply grooved furrows. 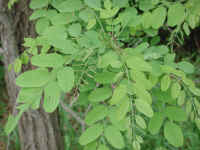 (Black Locust (Robinia pseudoacacia L.) - 07) The leaves of the black locust are described as being: alternate, pinnately compound with between 7 and 19 leaflets, and grow to lengths of 8 to 14 inches. What appear to be individual leaves are really the leaflets. 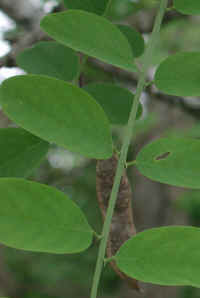 The actual leaf has a long central green stem with a terminal leaflet and several pairs of leaflets that usually grow opposite one another along the stem, which can be more easily seen in the next photo. 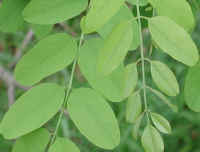 (Black Locust (Robinia pseudoacacia L.) - 07a) In this photo we have a closer look at a portion of two leaves with the terminal leaflet and the opposite growing pairs of leaflets. 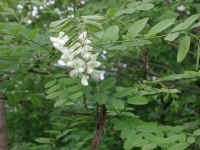 (Black Locust (Robinia pseudoacacia L.) - 08) This is another look at the flowers and buds of the black locust. (Black Locust (Robinia pseudoacacia L.) - 08a) This is another bee's eye view of a black locust flower. (Black Locust (Robinia pseudoacacia L.) - 10) This is an old weathered thorn that has survived on the bark of a main side branch of a black locust tree. 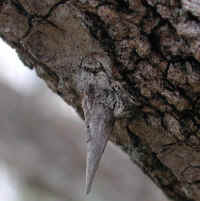 The actual size was about 1 inch long. 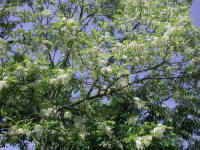 (Black Locust (Robinia pseudoacacia L.) - 11) This is a look at a black locust tree in bloom. (Black Locust (Robinia pseudoacacia L.) - 12) Looking into the woods at the trunk of a Black Locust tree.